We have several report card templates that display grades from multiple terms like “Three Four Galore”, “Quarterly Classic” and “Descriptive Joy”. We frequently use the “Three Four Galore” template as an example in our blog. For example, you can check out the articles entitled “QuickSchools Report Card Features” and “Subject-Specific Criteria for QuickSchools Report Cards”. When using these report card templates, the system does it’s best to figure out which columns to fill for any particular marking period. It does this by sorting the existing report card marking periods by date. So the first marking period will fill the first column, the second marking period will fill the second, and so forth. However, if you have several marking periods per academic term (like a mid-term and a final-term marking period), that may throw the system off, and you have to explicitly tell the system which columns to fills for the particular grading session. Then click on “Edit” for any particular grading session. 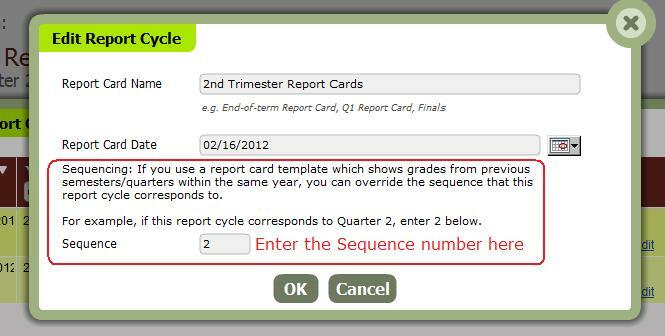 On this pop-up window, you can use the “Sequence” field to define which column to fill in the report card template. So for the first column, enter “1”. For the second column, enter “2”, and so on. And that’s pretty much it. As always, come chat with us if you require further assistance.